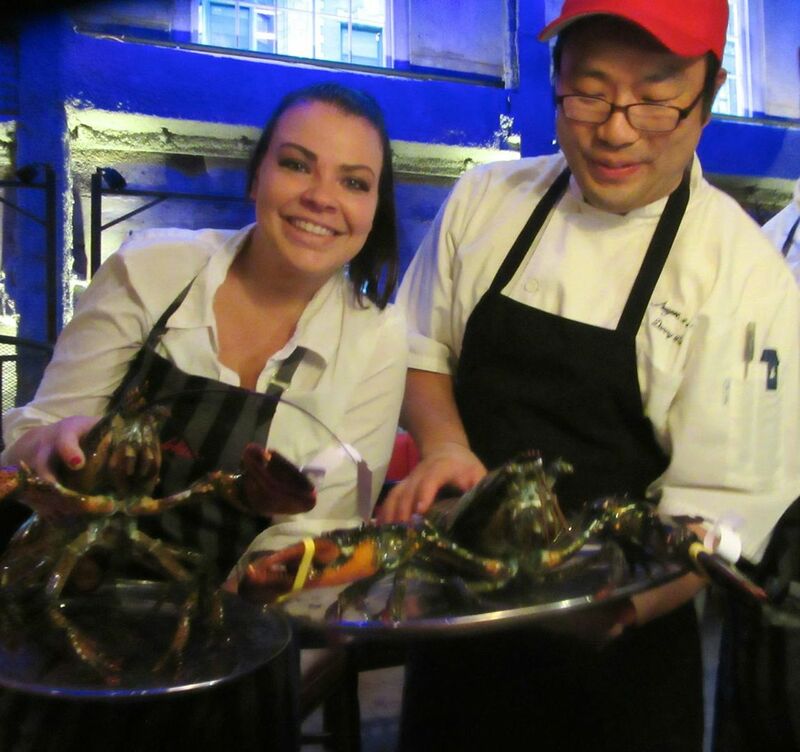 Our server and chef Danny Lee select two three-pound female lobsters for our birthday celebration. My friend Shelley has two birthdays to celebrate: her guy’s and her good friend Lisa’s. She decides the way to go is with monster lobsters. 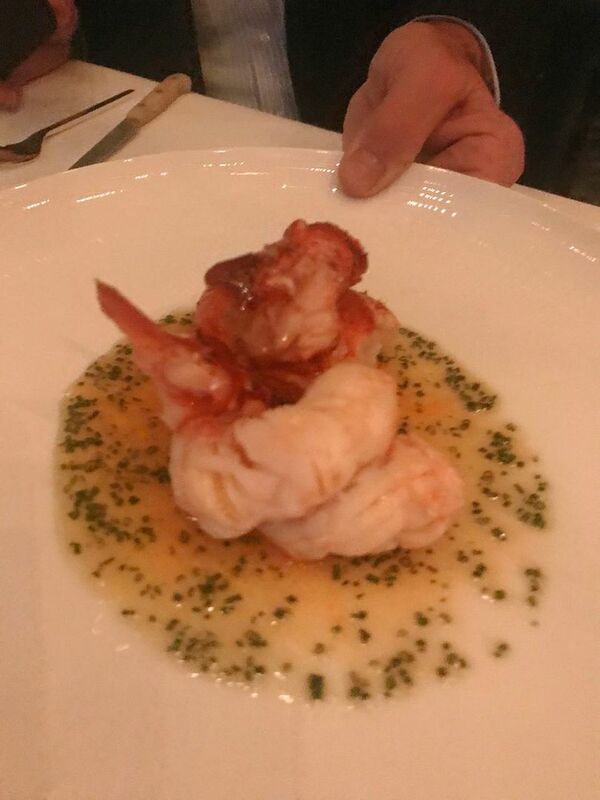 Only a few weeks ago, I dipped into lobstermania at NoMad. Instead of suffering from lobster overkill as might be expected, I’m primed for more. I’m not sure if Shelley invites me or if I invite myself. We inspect the big beauties lurking in the lobster tanks below before ascending for dinner. Photo by Dana Stoddard. 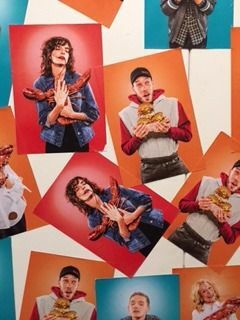 The elevator is papered with photos of Burger & Lobster eaters, a preview of what’s ahead for us. The four of us arrive at Burger & Lobster: Times Square at the same moment. We pause at the check-in desk to ogle outsize crustaceans floating in small seawater lockers. I’d better interrupt the narrative here. I should point out that Shelley happens to be the press rep for Burger & Lobster. Sorry about that. 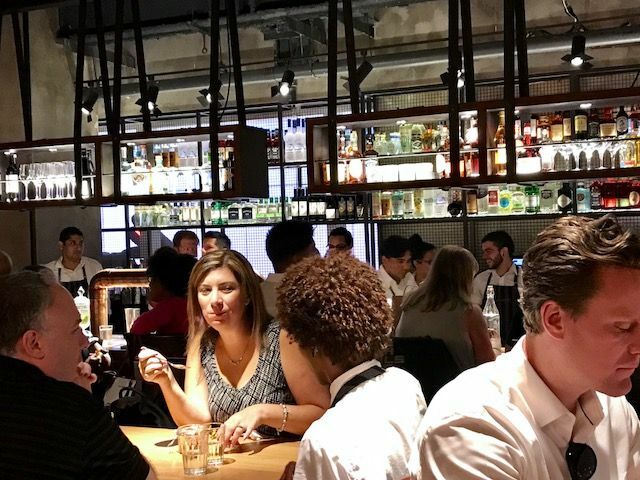 Restaurant critics shouldn’t be partying with publicists, I agree. But we’re friends now, and here I am. 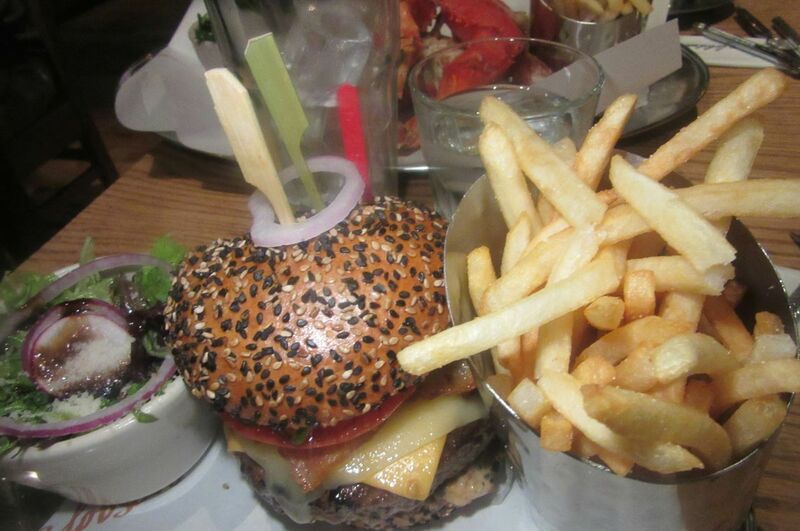 A memory of simpler days – just three choices -- at the original Burger & Lobster on 19th Street. I didn’t notice Burger & Lobster’s splashy original 2015 arrival downtown on West 19th Street, and I didn’t get there till Shelley mentioned it last August. You might wonder how a wildly successful British fast-food chain sneaked into a space that seats 320 without my noticing. But hey, this is New York. Go out of town for a week or two and you can miss a dozen restaurants opening or closing. Here’s the burger dinner my friend and I shared at that early dinner seated on the corner of a communal table. There was no menu then, just three $20 choices: A burger, a lobster roll or a whole lobster, each delivered on small metal trays with fries and a salad. The meat is a Pat LaFrieda blend of chuck, tri-tip and brisket “in perfect proportion for minimum shrinkage, maximum flavor and superior juices,” my pal wrote in her email. I have to smile at the hyperbole. After all, it takes poetry and chutzpah to sell a fast-food dispensary in a snooty town even if the critic is your pal. But anyway, I found the whopper to be juicy, sticky and good and the lobster roll buttery and generous. 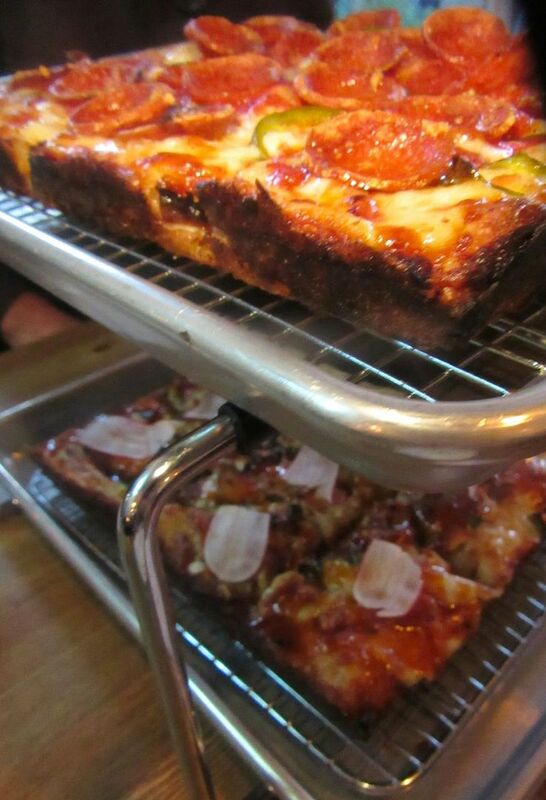 Click here to read Tasty Fixations. 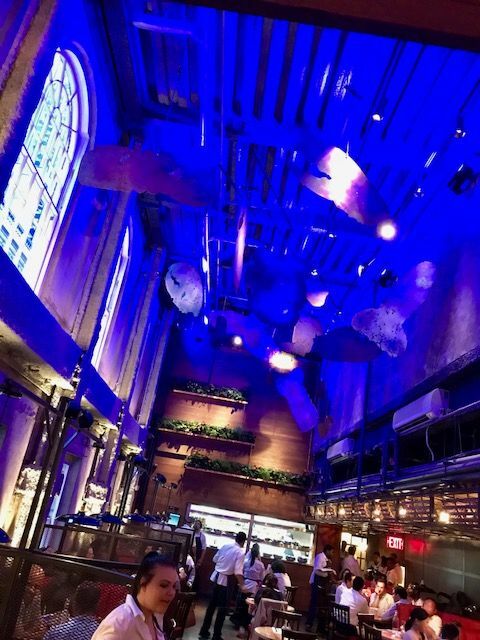 Photographer Dana Stoddard shoots the new soaring room, cathedral windows and a lobster suspended above. Now managing partner Vladimir Borodin’s ambitions have soared along with the sprawling new loft on West 43rd in the same building that houses the Stephen Sondheim Theatre. There are four manifestations of lobster roll dinner on the menu at $20 or $25 -- the Original, the Seven Samurai, the Po’Boy, and the Fiesta with corn, white cabbage, peppers, pico de gallo and chipotle mayo. 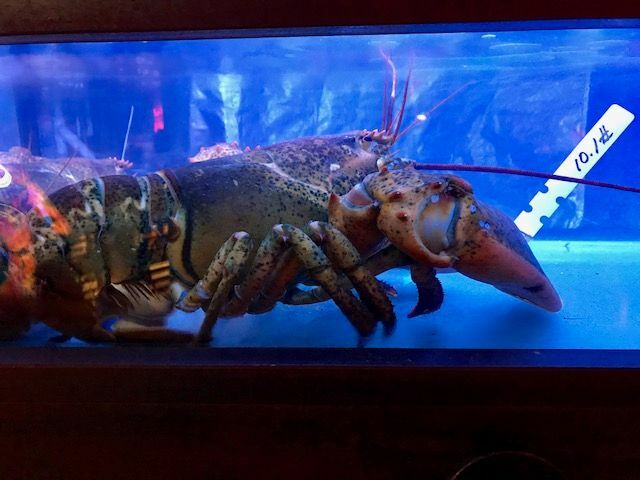 The $30 Beast delivers lobster meat on a 6 oz. beef burger with Swiss cheese and truffle mayo, salad and fries. 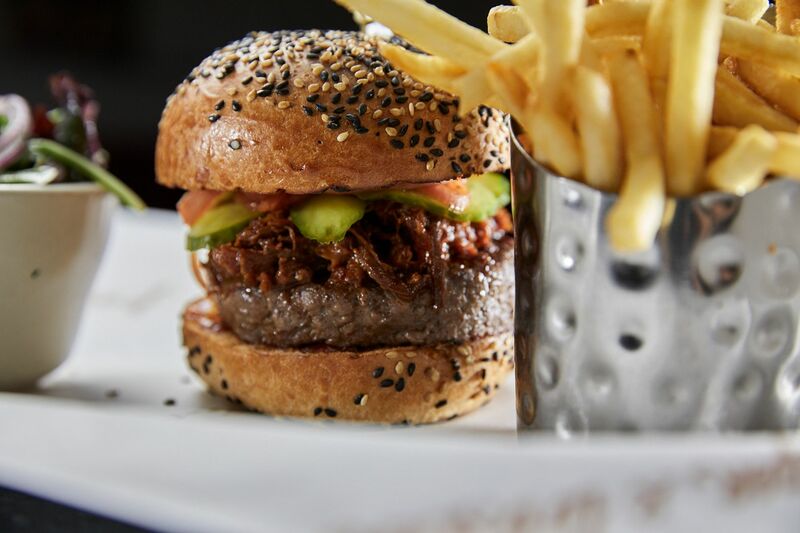 The BBQ Burger features pulled pork in BBQ sauce with pickles and onions on a 6 oz. burger. 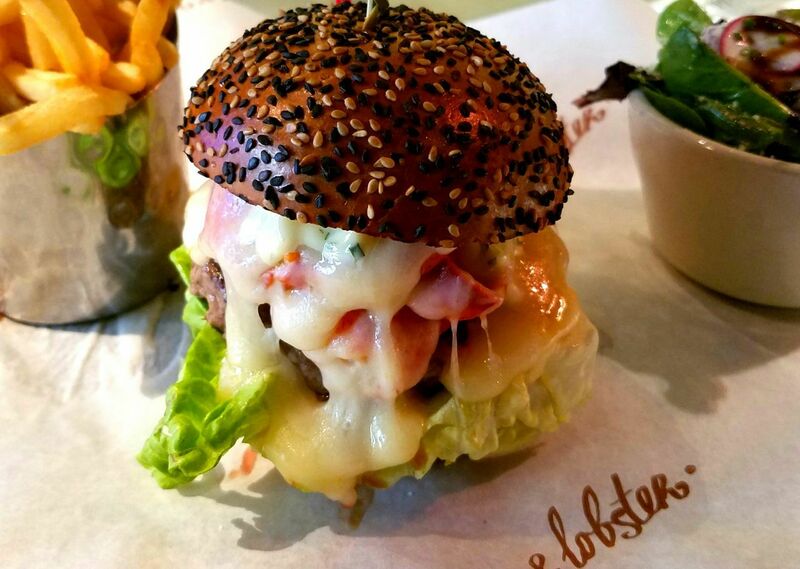 Besides the original, there is now a quartet of burgers from $16 to $33 – the London, the Beast (with lobster and truffle mayo), the BBQ Pork and the Frenchman. 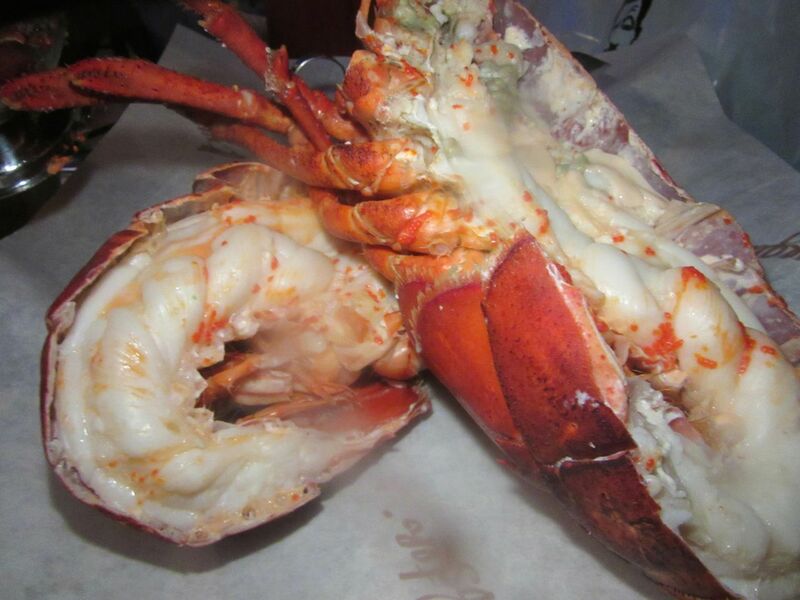 There are add-on sauces and combos, a $200 B&L Tower for four, and jumbo lobsters for $26 per pound. It’s a playground for all tastes, generations and hungers. 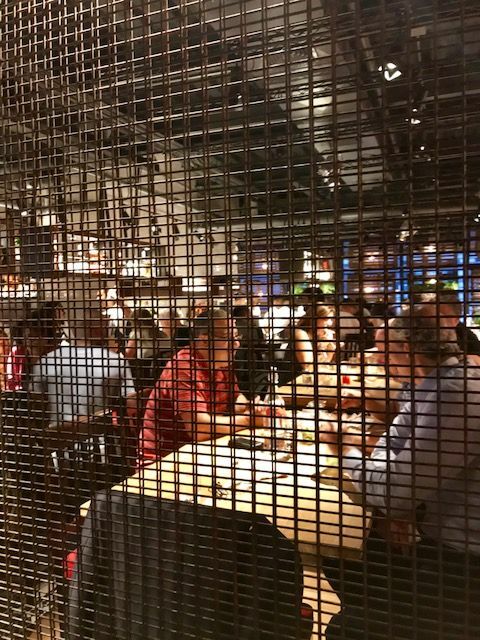 The space is divided by lobster traps. Manager Vladimir Borodin collected 300 of them. The space with its massive windows was theatrical to start. It’s even more dramatic now with a giant clawed creature flying in the nave overhead. Rooms are divided by lobster traps, 300 of them. 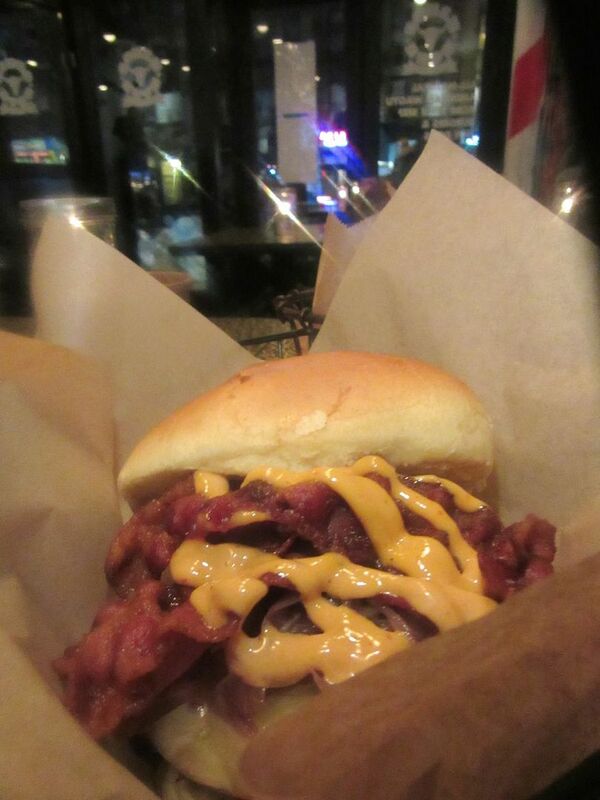 Come for a great pre-theater bargain of a burger or lobster roll dinner with fries and a salad, or go for broke. Chef Danny Lee suggests that Shelley order two three-pounders. “Female,” I chime in. “Their bodies are wider and they have eggs.” The chef and our server go down to the tanks below, returning with a duo of lively leviathans. “I wonder how long they live to get that big,” I muse. “Try not to think about it,” Shelley suggests. Our hostess orders burger bites and lobster bites to keep us amused while waiting for the main event. 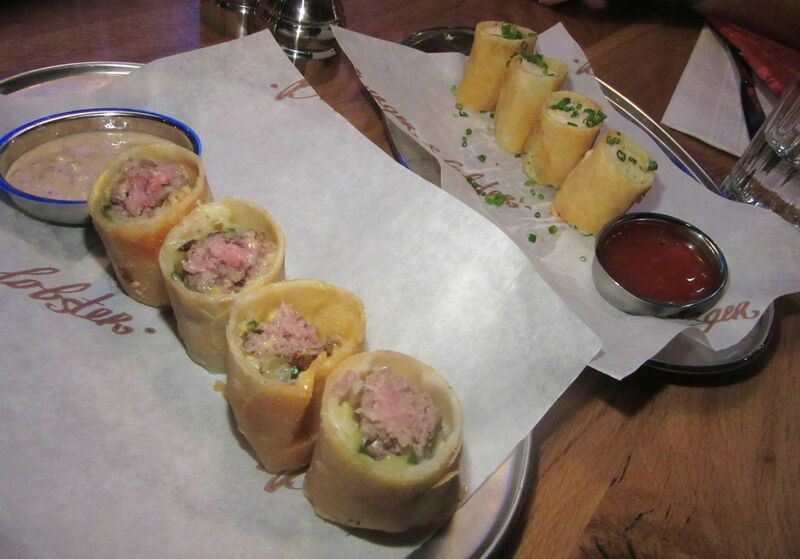 She orders pastry-wrapped burger bites filled with cheese and pickle to munch with cocktails while waiting. There are tasty lobster bites, too, wrapped with bits of shrimp in a corset of pastry with lemon zest and chives, to dip into sweet chile sauce. The server sets out the ubiquitous salad and fries that go with all dinners to cover our table. 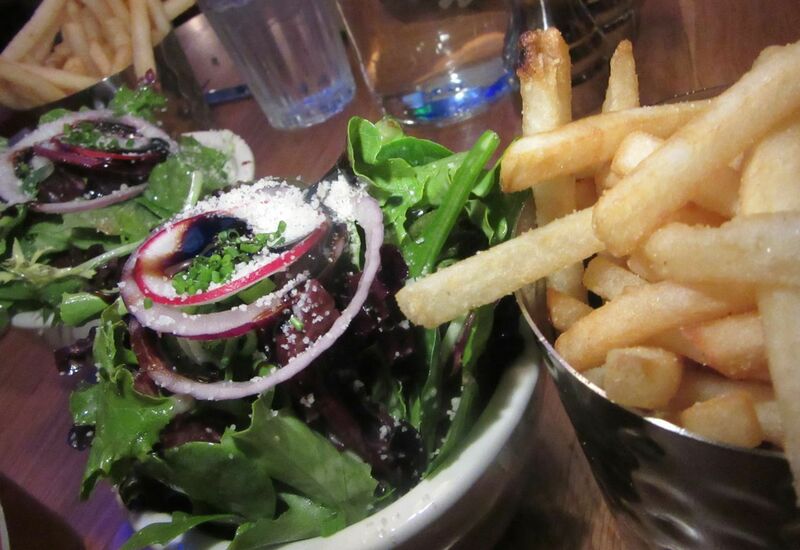 The server covers our table with the house’s usual sides – pretty good fries and a small salad. The salad tastes freshly tossed. “I think the fries have gotten better,” Shelley observes (in case I didn’t notice). It doesn’t take long to grill three-pounders (even when the house may be giving you three-and-a-half-pound monsters.) Buttery tails and mammoth claws piled on paper-lined platters soon crowd the table in front of Shelly, Lisa, and me. Shelley divvies up the parts of two mammoth crustacean. This is my generous ration. Eggs and tomalley in gravy boats are served separately. It looks like the kitchen has collected this precious stuff from every female lobster eaten in-house tonight and delivered it to our table. I seem to be the only one eating it. 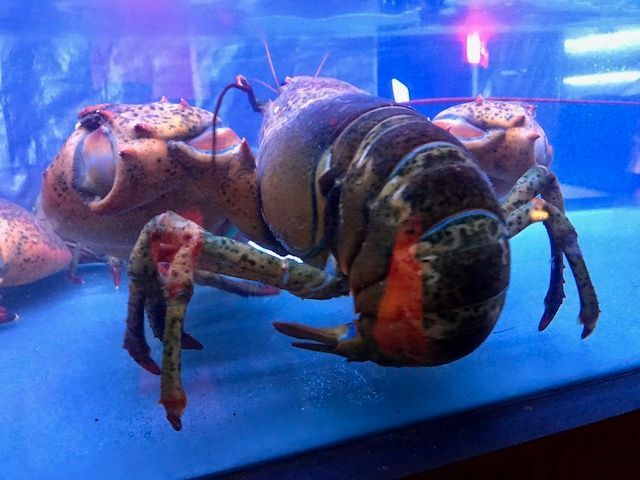 Did you know lobsters are high in cholesterol? I try never to think about it. I’m sure these esoteric scrapings are where the artery challenge resides. The birthday boy prefers meat. He orders the Frenchman, a burger with foie gras and cranberry jam. The birthday guy prefers meat. He’s chosen the $33 Frenchman: six ounces of beef with foie gras and cranberry jam. 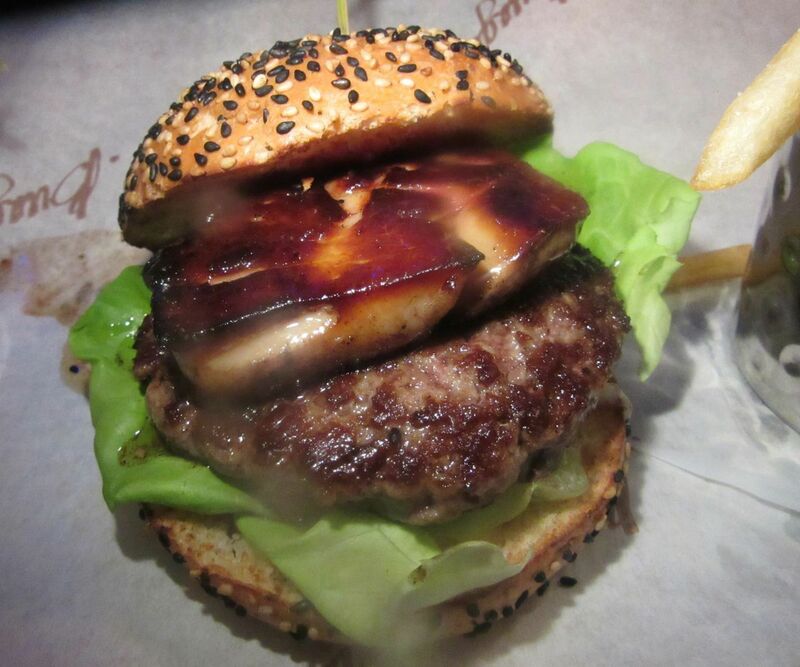 Actually it looks like almost six ounces of foie in his particular sesame seed brioche bun. He offers me a bite: The combination of aged beef, liver and sweet jam is luscious, almost thrilling. I offer him a lobster “feeler” and then another. I’m glad to see he likes the challenge of sucking out the flesh from narrow passages, which I will never have time to do since I’ve scarcely devoured half a chewy tail and I am already feeling full. A duo of desserts – chocolate mousse and strawberry cheesecake – are enough for all of us to share. Lisa seems to have excavated every available morsel of her share. Of course, she isn’t distracted shoveling up the innards as I am. Shelley and I ask for our leftovers. 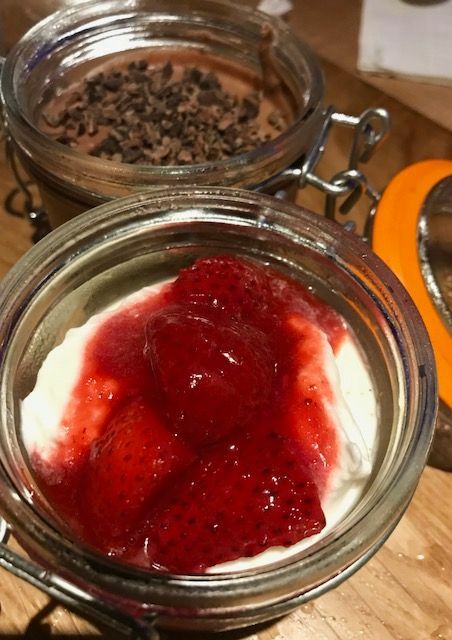 The server brings two desserts in canning jars -- the chocolate mousse and my favorite, cheesecake custard with strawberries. I have one bite of the creamy pudding and berries. My friends finish them both. My birthday is December 22, I tell Shelley. “Mine is November 3,” she says. There’s a savvy crowd eating, drinking and flirting in the bar area. Photo by Dana Stoddard. “We have to do this again in November then,” I say. I didn’t see the check, but I heard her insist on getting one, and then -- did I imagine it -- a small gasp? 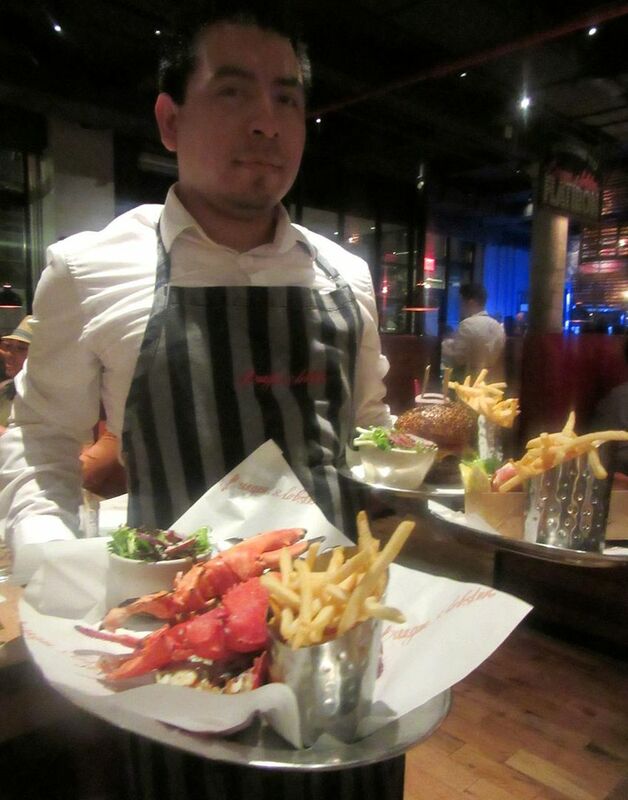 We linger to congratulate the lobster biggies who have survived the evening so far. We stagger past an attractive congregation in the bar area and hit the elevator. Downstairs, we stop to congratulate the survivors just inside the exit, some lively, most snoozing, seemingly oblivious to the whims of fate. 132 West 43rd Street between Sixth Avenue and Times Square. 917 565 9044. Monday 11:30 am to 10 pm. Tuesday through Thursday 11:30 am to 11 pm. Friday and Saturday 11:30 am to midnight. Sunday 11:30 am to 11 pm.